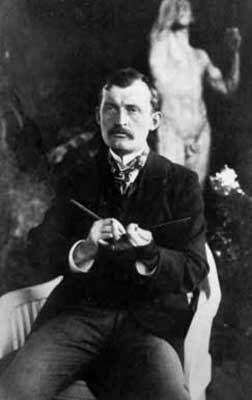 The Norwegian painter Edvard Munch (1863-1944) is one of the most ingenious and prolific figures of modern art. He stands between two major European artistic traditions of recent history: Symbolism (of French origin; a reaction to excessively naturalistic and realistic art; dedicated to evocation and allusions; an exploration of spirituality, imagination and dreams) and Expressionism (largely German in nature; given to portrayals of one’s subjective, rather distressed view of the world). The first was an influence for Munch and the second, he was known to have significantly influenced. 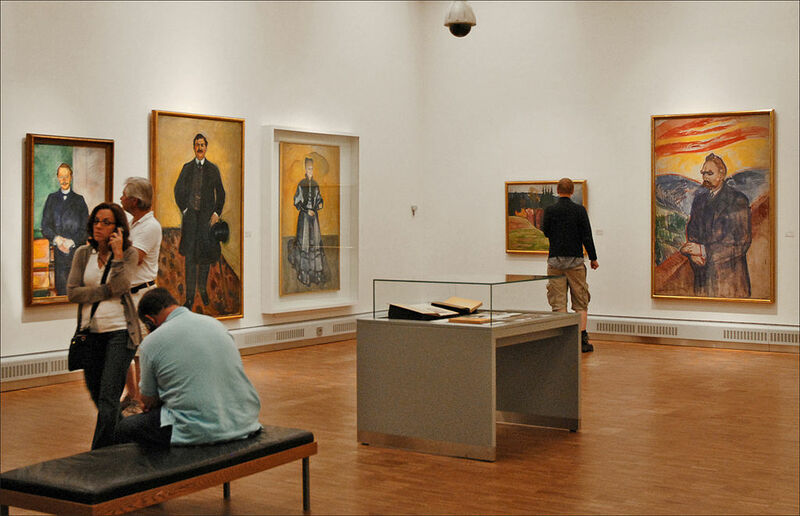 Many of his dark and intense psychologically-themed paintings can be viewed on the website of Munch Museum in Oslo. You can also check this gallery here. Munch was the second of five children. He was born in 1863 to Christian Munch, a poor military doctor, and Laura, who was half his age, in the village of Ådalsbruk in south-east Norway. Munch’s early years were gloomy. His mother and favourite sister died of tuberculosis in 1868 and 1877, respectively. Another sister was institutionalised for mental illness. His only brother succumbed to pneumonia at age 30. My father was temperamentally nervous and obsessively religious – to the point of psychoneurosis. From him I inherited the seeds of madness. The angels of fear, sorrow and death stood by my side since the day I was born. They followed me when I played – followed me everywhere. Followed me in the spring sun and in the glory of summer. They stood by my bedside when I shut my eyes, threatening me with death, hell and eternal damnation. Often I awoke in the middle of the night gazing around the room in wild fear – was I in Hell? Hence, an acute sense of loss, despair and alienation runs through almost all of Munch’s works. He began painting in childhood. And although, as a young man, he excelled in the study of engineering, he would abandon it to pursue his passion. He produced a large and impressive oeuvre, garnering attention in Paris and Berlin. His last years, during which he suffered from alcoholism and paralysis, were spent in seclusion in Oslo. Munch never married but he did have several affairs. Today Edvard Munch remains most famous for a painting which he created in four versions between 1893 and 1910 – The Scream. In May 2012, one of these was bought by the American businessman Leon Black for $119,922,600 at a Sotheby’s auction. The painting is very direct. Under a blood-and-fire sky, before a landscape of indigo and aquamarine, an androgynous figure (with the face of a fetus or an alien) stands shrieking on a bridge from the depth of its being. The painting is widely dispersed in popular culture. A simple Google search will yield the original subject being parodied by everyone from Homer Simpson to Macaulay Culkin to Barack Obama to antagonists of slasher films. One evening I was walking out on a hilly path near Kristiania – with two comrades. It was a time when life had ripped my soul open. The sun was going down – had dipped in flames below the horizon. It was like a flaming sword of blood slicing through the concave of heaven. The sky was like blood – sliced with strips of fire – hills turned deep blue the fjord – cut in cold blue, yellow and red colours – The exploding bloody red – on the path and hand railing – my friends turned glaring yellow white – I felt a great scream – and I heard, yes, a great scream – the colours in nature – broke the lines of nature – the lines and colours vibrated with motion – these oscillations of life brought not only my eye into oscillations, it brought also my ears into oscillations – so I actually heard a scream – I painted the picture Scream then. it articulated an important shift that occurred within Western culture around the turn of the 20th Century…[It] is one of those images that sums up a changing point in history. It presents man cut loose from all the certainties that had comforted him up until that point in the 19th Century: there is no God now, no tradition, no habits or customs – just poor man in a moment of existential crisis, facing a universe he doesn’t understand and can only relate to in a feeling of panic. That may sound very negative, but that is the modern state. This is what distinguishes modern man from post-Renaissance history up until that moment: this feeling that we have lost all the anchors that bind us to the world. Jill Lloyd’s suggestion of this “loss of all binding anchors” brings to mind the condition of “the absurd” expressed by the French philosopher Albert Camus (1913-1960) in his famous 1942 essay The Myth of Sisyphus. The work was essentially an attempt to resolve “the problem of suicide”. Camus, a lapsed Catholic, forcefully argued that ‘a lack of belief in God’ and ‘an inability to see life as inherently and ultimately meaningful and valuable’ were no justifications for self-annihilation. One could, thought the daring Nobel prize-winning thinker, within the limits of nihilism find the means to proceed beyond nihilism. Suicide has absolutely no legitimacy. The essay is complex and raises many issues but some of its most striking lines are those that articulate “the absurd”. What is it? Camus says – a situation wherein man suddenly feels himself an alien, a stranger in a universe suddenly divested of all lights and illusions. Man’s exile is without remedy because now there is neither memory of a lost paradise nor hope of a promised land. The absurd is a divorce – between man and this life, between actor and setting. The absurd is the conflict between man’s desire to seek meaning in the universe and his failure to find any. It is the revolt of the flesh that occurs when he is greeted by an unreasonable silence. The feeling of absurdity can strike a man at any streetcorner. Anywhere and at anytime can the primitive hostility of the world rise to face him across millennia. It is precisely this that Munch so expertly captured. is not the last word. But, in its articulation of pain and suffering, in its diagnosis of our human condition – a condition that must be killed and then recreated, not merely improved upon – it must be the first word that we hear. Diagnosis leads to prescription. I think that Siedell is trying to suggest that our dissatisfaction with the universe is simultaneously an admission of its ‘Fallenness’ and an indication of our capacity for something more…perhaps ‘Resurrection’? Those who want to know more about Munch may want to watch a 1974 Swedish-Norwegian biopic on him made by the British filmmaker Peter Watkins. The film, which covers thirty years of Munch’s life, was screened at the 1976 Cannes Film Festival. Read more about the film in this wonderful essay published by the New York-based Film Society of Lincoln Centre. A fascinating read ! And scary ! Spooky! Just watching ‘The Art of Scandinavia’ incl this Munch & the Carta Marina. Terrific blog! 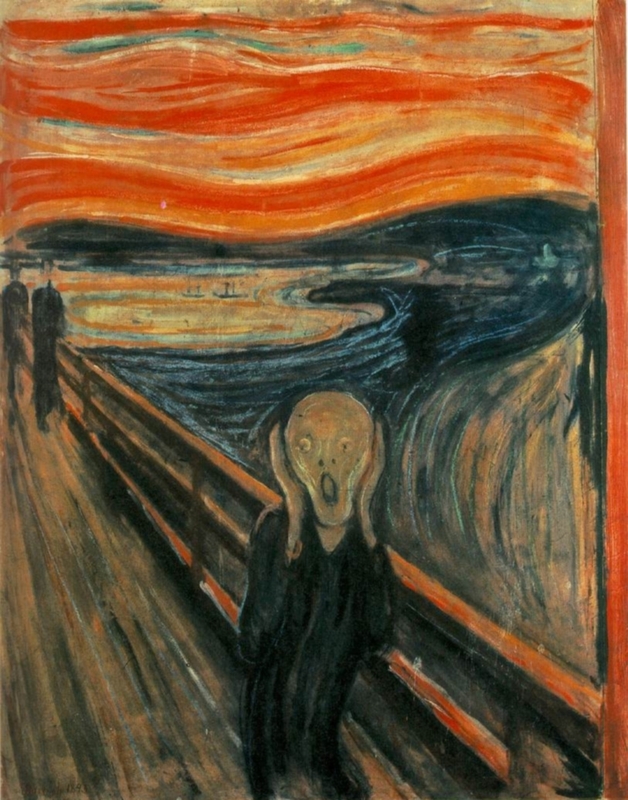 I have always been drawn to Munch’s The Scream and am an intense admirer of Camus. I didn’t know about Peter Watkins’ (incredible filmmaker) film on Munch, so I will be watching that soon. Thanks. Merci for visiting 24/7 in France, author of “Solitary Desire-One Woman’s Journey to France”- video http://youtu.be/xG_YTa5sDac & wishing you a bon weekend! You’re welcome 🙂 and thank you for your comment and the link!